I like beer and babies. 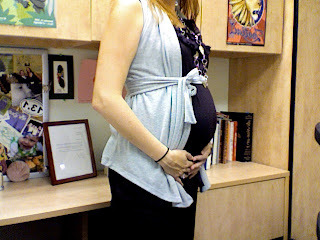 : Preggo my Eggo Update: 24 weeks down, 16 to go. Things have been going smoothly lately. Baby is getting bigger, my a$$ is getting bigger, etc. A little bit of back pain here and there, but that is par for the course. Overall, I am enjoying being pregnant more the second time than I did the first. There is just less to worry about, learn and prepare for. I know what lies ahead and it is not that bad. A few months of sleepless night are worth a tiny drooling pile of goo falling asleep on my chest. To try to incorporate some healthy(er) food into my ravenous sweet tooth, I tried a recipe for apple muffins and they were delish! Hope you enjoy them as much as we did. Preheat oven to 400 degrees.Place cupcake liners inside a 12-cup standard muffin tin. Mix sugar, flour, baking soda, salt, cinnamon and nutmeg in a medium bowl. Add diced apples and walnuts, tossing to coat. Whisk together eggs, yogurt and butter in a small bowl. Gently fold the liquid mixture into the flour mixture. Don’t overmix or the muffins will be tough. Divide batter evenly among 12 muffin cups (they will be full!). In a small bowl, mix brown sugar with cinnamon. Sprinkle mixture over the tops of the muffins. Bake for 16 to 18 minutes or until muffins are brown around edges and spring back when touched. Devour at least two muffins with milk while they are still warm. Once you are satisfied, let the fam know you made muffins and share if there are any left.